The bicycle was hoisted in the air above the crowd gathered outside the Haymarket subway stop in the North End of Boston. The chanting, jumping, occasionally naked, largely drunk, and mostly aggressive crowd pulled the bike in, consuming it as if the hungry mass had formed a unified sentience. If you subbed out the hockey merchandise and anti-Canadian sentiment it was almost as if Osama Bin Laden had been bought back to life only to be killed again. 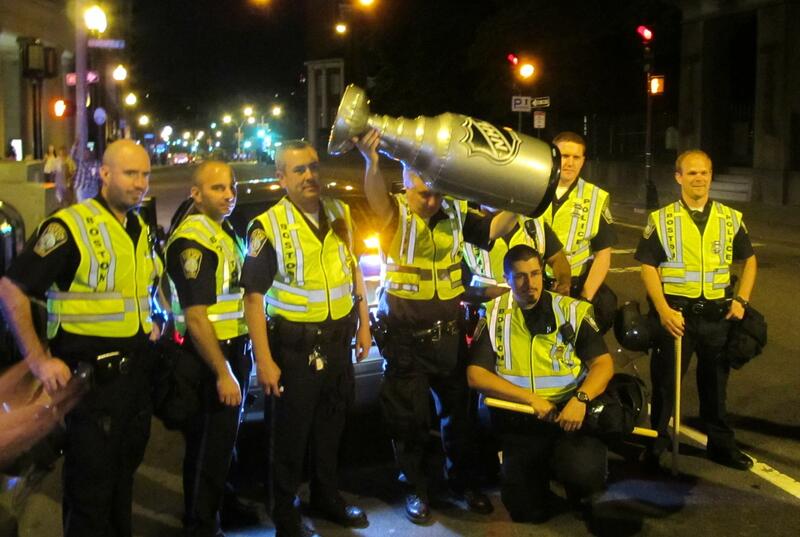 One could posit that this was about more than the Stanley Cup. Riot police advanced in on the crowd with a slow, creeping insistence. 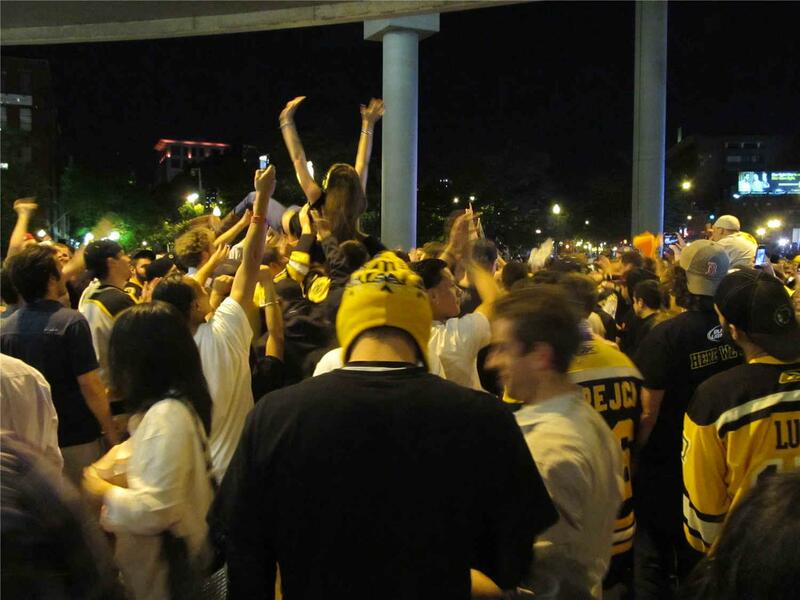 On the closed down streets of Boston, just after midnight on a mild June evening, it was the United States versus Canada, Boston versus the world, and Boston against its own demons, putting to rest 39 years of ice-hockey failure. I could not quantify the size of the gathering. People were gathered as far as my eyes could see, and judging by the volume of the roars, further than that as well. “Good thing we won,” I thought to myself. 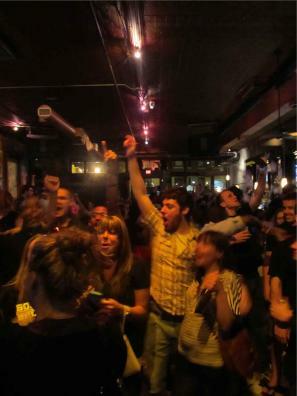 In the midst of it all there seemed to be a fine line between jubilation and anarchy. I had begun the evening unaware of the either-or precipice of chaos that we were approaching. I had left for the game – Vancouver versus Boston, winner takes all – with my companions, foolishly, ten minutes before tip-off. Every establishment of note in our neighborhood had queues stretching nearly around the block. And by ‘establishment of note’ I’m referring to the classic Boston bar, with an average of 20 television screens to play sports on, to accommodate the four local sports teams each with a net worth exponentially higher than the All Blacks. As a New Zealander I have no experience with significant large-scale public celebrations of sporting achievement. I had no idea of how big this could be. The America’s Cup never forced people into the streets, overcome and yelling at the glory of it all. Yachting just doesn’t have that transcendental power… over anyone. Our netball success has always been met with reasoned declarations of approval. And with 24 years since our last Rugby World Cup victory we’re mostly set as a nation now to expect disappointment. Unable at first to get in anywhere, we came across a tacky dance club who were beginning to be over run by the demand for hockey. Two-thirds of the way through the game, the bartender asked if he could turn the sound of the game off so the DJ could start. People were not amused. Motion defeated. I had never seen a hockey game in my life. I knew nothing of the sport, but I do enjoy a bandwagon to jump on. The game is fluid, chaotic, and quick. 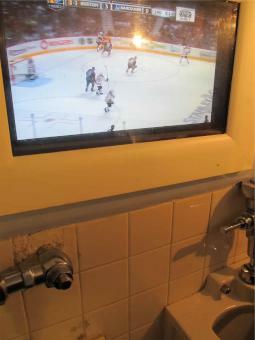 It runs on TV with out the commercial-laden downs and time outs that so plague football and basketball. Even on television, the speed of reflex on display is obvious. But Hockey’s dexterity is undercut by its sense of violence. It is a sport full of contact and provocation. A fight is treated with the same severity as a hand in the maul in Rugby, and can only be artificially ended when someone hits the deck. The rinks’ glass encasement is rigged with microphones to amplify each collision. The players seem to be groomed into a brusque, lumberjack mould. Heading into the game, Boston was not favored. So at 1-0 the tension was indelible, the crowd disbelieving of success. At 2-0 when, ironically, the Canadian-born, baby-faced Brad Marchand scored, euphoria started to take hold. A stranger hugged me at the bar. At 3-0, the two men next to us took off downtown, “to try and get to the riot early.” At 4-0, the bar shook. It was rumored that half the world would descend on the TD Garden, the Bruins’ castle. 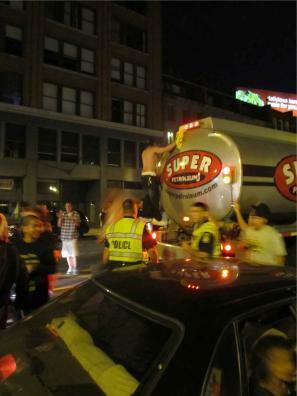 The 2008 Celtics NBA victory saw 23 arrests and one death, the 2007 Red Sox World Series win saw 37 arrests and a truck overturned, and there was a death after each of the Boston Super Bowl and World Series wins in 2004. We made it downtown, to the TD Garden, to find at first that we’d gotten behind the line of riot police that had set up. We doubled back, and found the action. There were thousands of celebrating fans. They were giddy, huddled together, climbing anything and everything in sight. Hundreds spilled out onto the roads, bringing to a halt a line of trucks, whose summit was then scaled. For what end, who knows. There was steam to be blown off, and the people needed goals and activity. Outside the subway stop, casual property destruction began to take place. A girl nearby me was sprayed with glass. A mosh pit broke out in one section of the crowd, ecstatic and violent, the participants charging each other in not too dissimilar a fashion to what they’d seen on TV that evening. 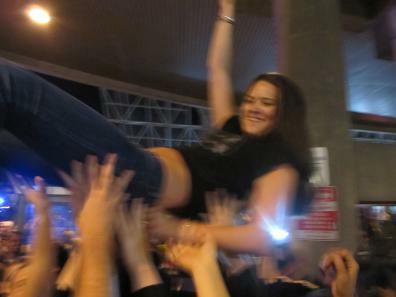 Girls crowd surfed, revealing their chests to enthralled, horny men. The air was taut with something indescribable and alive, a mix of danger, community and victory. It felt for a small moment like the night could fall on either side of the law. I pulsed with adrenaline. The evening ended on the right side. I do not have the stomach for conflict. The roads were gridlocked, and the trains had stopped running. I would have to walk 90 minutes home. The pleasure of the crowd was audible for many blocks, and the masses snaked through the city. Further away from the city center, it all relaxed. Cops smiled and posed for photos. Doormen joked around with drunks. I high-fives more strangers than I would like to admit. Cops bussed in from surrounding suburbs were shuttled back out. My adrenaline subsided at some point on the walk and I soon realized how tired I was. I woke to news the next morning that Vancouver had burned, literally, post-defeat. Police announced only two arrests in Boston. 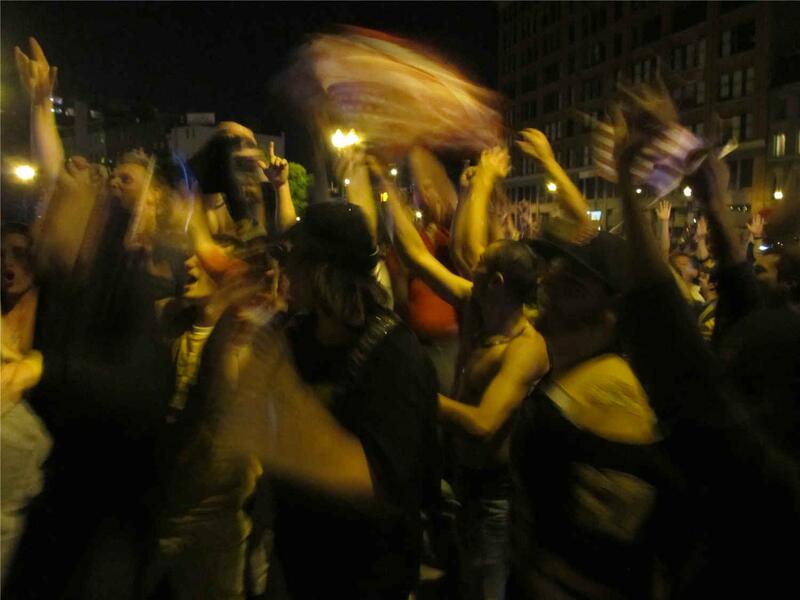 It would come down on the tamer scale in Boston’s sports riot history. “Good thing we won,” I thought again.